Yes, of course. Please contact us as the monthly rates are more than the annual plans so it is better to signup for an annual plan. We will bill your credit card for the service with a monthly or annual automatic renewal based on the type selected upon signup. Do I need to have access to my domain records? Yes. You may contact your hosting company or in some cases your web designer, depending on who you may have given access too. If you need help finding out where your domain name is registered, please contact us OR you may use a tool like http://www.network-tools.com. Type in your domain name and select DNS from the options. If I get a massive mailbomb, will I be billed a gazillion dollars? Don’t worry! Every customer gets free protection from overage billing spikes. You are protected against billing spikes that are more than $20 over what your domain averaged for the past 3 billing cycles [ see details ]. Will pointing my MX record to SpamRaptor affect the deliverability of my outbound messages? No. An MX record points to your inbound mail server and it is quite common for the outbound mail server to be different than the inbound server. We have never heard of anyone having an issue with their email getting blocked because their inbound (MX) server does not match the outbound server. It is a common misconception that deliverability issues can occur if you point your MX record to a server separate from your outbound mail server. This myth stems from the fact that many email servers do what is called a “reverse lookup”. However, this reverse lookup is against the IP address of your outbound server and has nothing to do with your inbound (MX) mail server. The purpose of this lookup is to confirm that the IP that you sent your message from points to a hostname that points back to this same IP. That confirms to them that you are not spoofing the hostname of your outbound server. What is the size limit for email messages and attachments? The maximum message size allowed for a single email message is currently 500 megabytes. Is it safe to turn off the anti-virus program on my computer? Not all virus threats come by email. While our filtering system has been found to be very effective at also blocking viruses, the more layers of protection that you can have on your computer, the better. I don’t want to lose any email. How reliable is your service? If your mail server were to go down, our mail servers would queue your email (for up to five days) and your mail would be delivered automatically once your server comes back online. Each domain we filter email for is assigned to three redundant mail servers that are located in separate data centers. Should the primary filtering server go down, there are two others that will immediately begin to queue your email until the issue with the primary server is resolved. We provide a free quarantine viewer for your domain that will store all email that is blocked for at least 30 days. Even though it is extremely rare for our SpamRaptor to block a real message, you can have peace of mind in knowing that you can always release a message from the quarantine viewer if it gets placed there. How do I change the MX record on my domain? It depends on who handles your domain’s DNS records. In most cases, this will be your web hosting provider. We will provide instructions that you can forward to your web hosting provider so that they can update your DNS records for you. If you’re comfortable making the change yourself, many web hosting providers also provide a control panel that you can login to and make the change yourself. If your web hosting provider does not provide DNS services for your domain, they can usually tell you who does and point you in the right direction. If your web host isn’t able to help you, let us know, and we’ll help you get this done. When email is sent to your domain, the sending server checks your domain’s MX record. This record tells the world what mail server handles your email. When you subscribe to the SpamRaptor service, you will change your domain’s MX record so that it points to our mail servers instead of your domain’s actual mail server. At that point, all your email will be routed to our servers, where your email will then be filtered and just the good mail will be forwarded on to your real mail server. Remarkably effective. Because our filtering rulebase is updated multiple times per day by real humans, SpamRaptor is able to block new spam messages that our competitors often miss. We are so confident that you will be impressed by our service that we offer a 14 day free trial so you can try it without spending a dime. Is the trial period 100% free? Yes! The trial period is completely free. You will not be billed until the end of the trial. If you’re not impressed by the performance of SpamRaptor then simply email us to cancel the service and switch your domain away any time during the trial. We don’t have an option for deleting all mail from the quarantine at once yet. If you are not able to turn of the SPF filter on your mail host, to resolve this issue you will need to turn on the SPF Workaround feature. To do so, log into your SpamHero Control Panel, then click Settings > filtering policies. 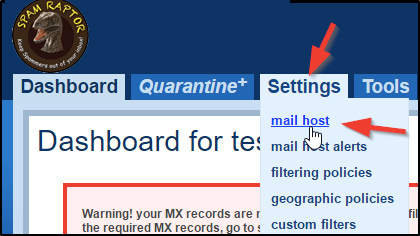 Please note, if your domain’s MX records don’t match, or if you are using only 1 or 2 of the recommended records, or if you have another MX record that isn’t on the recommended list, then you will get this warning in the Dashboard.